Aaaaaaoooooowwwwwww!!!!! Who doesn’t like wolves? These guys have lots of variety for draw but in general they revolve around the pack (allies) as seen with Bloodpack Shaman as well as armor like Wrath of the Forest. However the primary draw engine is Blood Moon which has one of my favorite arts in the game. •Darkclaw – 3SE: Until the start of your next turn, your weapons have +2 attack and Darkclaw has ambush (his attacks can’t be defended). •Moonstalker – 3SE: Moonstalker and all friendly allies have stealth (they can’t be attacked) until the start of your next turn. •Bloodfang – 5SE: Target Wulven ally in your hand is summoned at no cost and it gains +1 base attack and +1 health. 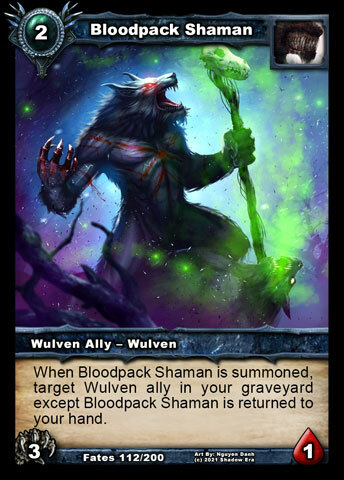 •Bloodpack Shaman (2cc – 3/1) When Bloodpack Shaman is summoned, while every ally in your graveyard is a Wulven ally, target Wulven ally in your graveyard with cost 3 or less is returned to your hand. •Soothjaw (4cc – 3/5) When a friendly Wulven ally is killed in combat, that ally is shuffled into its owner’s deck and you draw a card. •Cryptspawn Tormentor (3cc – 3/4) When Cryptspawn Tormentor is killed by an ability while there are at least 2 Undead allies in your graveyard, Cryptspawn Tormentor is returned to its owner’s hand. •Slingblade Demon (3cc – 3/3) When Slingblade Demon is summoned, you may return target other friendly ally to its owner’s hand to renew 2 resources. •Belladonna (4cc – 4/2) When Belladonna is summoned, draw a card. •Wulven Tracker (4cc – 2/4) Wulven Tracker is a wolf ally. When Wulven Tracker deals damage, draw a card. •Falseblood Cultist (4cc – 2/4) When Falseblood Cultist is summoned, you may discard target card in your hand to draw 2 cards. •Der’kan, the Bone King (4cc – 3/4) When Der’kan is summoned while there are at least 3 Undead allies in your graveyard, target opposing hero or ally takes 2 ice damage. When Der’kan is killed while he is the only ally you control, he is returned to his owners hand. •Shadow Knight (5cc – 5/4) When Shadow Knight is summoned, return the top ally from your graveyard back to your hand. •Darkwood Wraith (5cc -2/5) When Darkwood Wraith is summoned, target ally with a cost of 3 or less is returned to its owners hand. 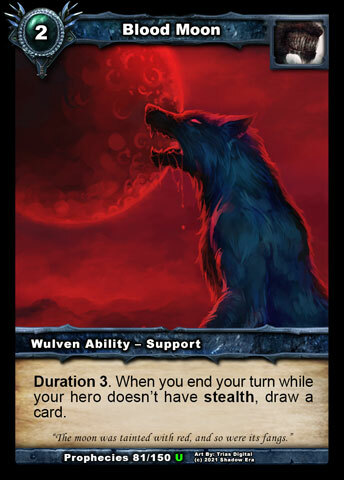 •Midnight Howl (1cc) Attach to target friendly Wulven ally until the end of your turn. That ally gains haste and is returned to your hand at the end of your turn. •Blood Moon (2cc) For the next 3 turns, you draw a card at the end of your turn if your hero doesn’t have stealth. •Wulven Rally (2cc) Target Wulven ally in your graveyard is placed on top of your deck. Target Wulven ally in your graveyard is returned to your hand. •All Hope is Lost (1cc) Target opposing hero takes 5 unpreventable damage if its controller’s deck is empty. Draw a card. •Sacrificial Lamb (2cc) Sacrifice an ally. Draw cards equal to that ally’s cost, to a maximum of 3. •Here Be Monsters (3cc) Destroy an enemy resource if they have equal to or more resources than you. Draw a card. •Overwhelm (5cc) All opposing heroes and allies take 1 damage for each ally you control. Draw a card. •Word of the Prophet (1cc) Up to 3 cards in your hand are shuffled into their owner’s deck and then you draw the same number of cards. •Bad Santa (2cc) Both players draw 3 cards, up to their maximum hand size. •Melt Down (2cc) Destroy an item you control. Draw two cards. •Master Smith (4cc) Return any weapon or armour from your graveyard to your hand. •Ley Line Nexus (5cc) Destroy target item with cost 5 or greater. Draw a card. 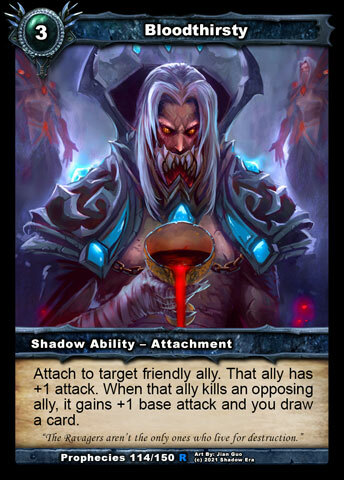 •Bloodthirsty (3cc) While Bloodthirsty is attached to target friendly ally, that ally has +1 attack and each time it kills an opposing ally it gains +1 base attack and you draw a card. •Confluence of Fate (2cc) Sustain: 1HP. Attach to your hero. At the end of each of your turns, draw a card for each attachment you summoned that turn, to a maximum of 2 cards per turn. •Tombstone Beacon (3cc – 3d) 1D: If you summoned an Undead ally this turn, 1 of your resources is renewed and you draw a card. •Loom of Fate (1cc) 1: All players draw a card. 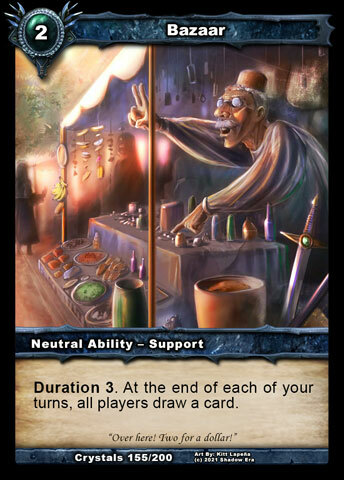 •Bazaar (2cc) Ongoing: Each player draws an extra card at the start of their turn. •Crystal Shards (2cc – 4d) Any player may activate the following ability on their turn: 1D: Discard a card from your deck and draw a card. •Aldmor Conduit (3cc) Any player may use the following ability on their turn. 1SE: Draw a card. •Looter’s Baton (5cc – 1/4) When your hero kills an ally in combat, draw a card. 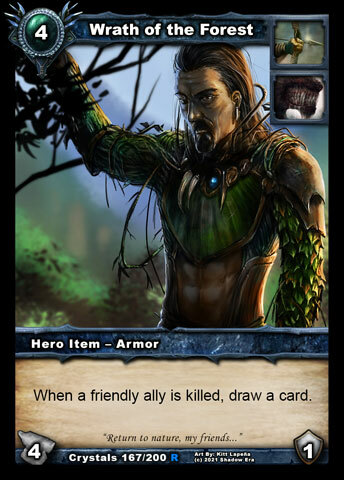 •Wrath of the Forest (4cc – 4/1) When a friendly ally dies, draw a card. Tagged bloodfang, darkclaw, moonstalker, Sf, Shadow, Shadow era, shattered fates, wulven.